Ambassador To Afghanistan: 'Vast Majority' Of Afghans Support Coalition : The Two-Way Most Afghans realize that the presence of U.S. and coalition forces has "literally reshaped their country after decades of war and conflict," says Ambassador James Cunningham. Also: A top general says stress of fasting during Ramadan may be factor in "green on blue" attacks. With "green on blue" attacks by Afghans in uniform increasingly in the news, Americans officials are being asked whether the people of Afghanistan are turning against the coalition troops that have been in the Central Asian nation since late 2001. The U.S. ambassador to Afghanistan, James Cunningham, told NPR Thursday that it's not America's allies who are shooting at U.S. and coalition forces (or in some cases, attacking with suicide bombs). "These are very unfortunate and sad events, and we and our Afghan partners are working hard to understand what's happening, why it's happening, and how we can prevent it," he told Weekend Edition host Scott Simon, in a conversation due to be broadcast Saturday. "But ... while they're difficult for both of us — they affect the Afghans as well as the [international forces] — they are a minor part of many thousands of interactions that take place between our military forces every day. And we're determined to find a way to minimize and end them, if we can." Cunningham also said that "it's pretty clear, based on our own contacts and polling that's done here, that by far and away the vast majority of Afghans support the international presence here — military and civilian. They realize that it has literally reshaped their country after decades of war and conflict and want very much to have an ongoing partnership with us going forward." Related news: Thursday afternoon, NPR Pentagon correspondent Tom Bowman said on Talk of the Nation that Gen. John Allen — the U.S. Marine in charge of the war in Afghanistan — told reporters earlier in the day that there are likely several reasons there have been a spate of green on blue attacks in recent weeks. Tom said Allen points to "Talliban infiltration ... also personal grudges and grievances against American soldiers by Afghans. And he also mentioned something interesting ... the holy month of Ramadan, which is just wrapping up." 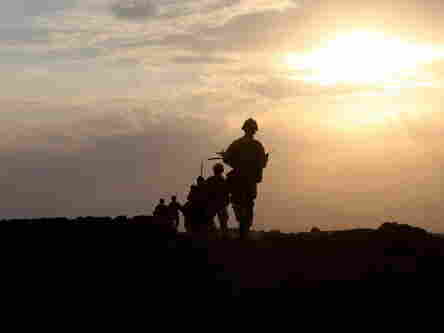 Muslims fast from before dawn until after dark during Ramadan and Allen theorized that "the fasting ... the high number of combat operations ... may have caused some of these Afghan soldiers and police to snap somehow and lash out at American forces," Tom said. Also on Talk of the Nation, Dexter Filkins of The New Yorker said that "the evidence that the U.S. military has been able to gather" indicates that "only a small percentage of these attacks are due to Taliban infiltration." Instead, military officials believe "that the overwhelming majority of these – 90% — are due to sort of personal reasons," Filkins said. They're being carried out by "angry Afghans, insulted Afghans." "In many ways," he added, "that's more troubling. It's one thing if you say, 'well, the bad guys are getting in.' You can [always] stop that. But what happens when it's the country you're trying to help?"